Can Britain catch Germany? Can pigs fly? But why even think in these terms? It would make a lot more sense to examine ways of stopping the widening of the gap. The think tank CEBR reckons Britain will not only overtake its old rival France soon but also that the UK stands a good chance of narrowing the gap with Germany by 2020 and leaping ahead of Europe’s economic powerhouse by 2030. Now, economic forecasting is not an exact science and it is mighty difficult to predict even a year ahead. The CEBR found that out when they finished 37th out of 40 economic forecasters for the year 2013, according to the Sunday Times’ league table. Are the predictions about Britain v Germany any more credible? As a German living in this country, perhaps I am biased, but I think not. The 2013 figures show Germany at $3.65trillion, France at $2.65trillion and the UK with $ 2.45trillion of output. To catch up with France within the next four years, Britain would need around $50bn in additional output per annum, or a roughly 2 per cent higher growth rate. That could be on the cards, given the woes of the French economy. As for narrowing the gap with Germany by the year 2020 that looks a bit tougher. German GDP is 45 per cent higher than Britain’s; not surprisingly as Germany has a 33 per cent larger workforce (40m vs 30m) and productivity is more than 10 per cent higher. The CEBR argues a weak euro will make it harder for Germany to stay ahead, though most analysts believe the opposite, as a weak currency helps the country’s thriving export industry. Even a chronically low birth rate in Germany is unlikely to have much effect. It has always relied on an influx of Gastarbeiter, or guest workers from abroad, to bolster the labour market. It is doing so now after having successfully integrated 22m newcomers after the fall of the Berlin Wall in 1989. The danger with selling illusions about the future is that it can breed complacency among businessmen and politicians alike. Britain could easily do better and should do so. But it has to be realistic about its position in the world and the huge effort it needs to turn around its growing balance of payments deficit, to increase business investment, to make sure its youngsters have the right education and skills, to improve its infrastructure, to raise productivity and not to rely on rising house prices to fuel another consumption-led boom. All that needs to be tackled at a time when the Government is trying to get the deficit down, whilst Germany will have a balanced budget in 2014. Could it be done? I believe it can, but it needs a shift towards long-term strategies in business and government. Selling British businesses and assets for short term shareholder value and calling it “Inward Investment” is not the answer. Mergers and acquisitions are no match for organic growth strategies; neither is paying the largest dividends as a percentage of profits of all developed economies. The UK has an abundance of entrepreneurs but cannot emulate the Mittelstand – the small and medium businesses that are the backbone of the German economy. All too often starved of adequate bank finance, those that make it over the first hurdles are soon driven into the arms of private equity or the stock market and too many are swallowed up and disappear. His words should haunt British politicians. If the UK wants to reduce its dependence on the City and get properly into the international race and not with an arm tied behind its back, it should do something about growing more SMEs into JCBs. It’s the real economy, stupid. The sale of Invensys, one of the last remaining substantial engineering companies in the UK, to the French industrial giant Schneider Electric simply beggars belief. The declared aim of this Government is to rebalance the economy towards manufacturing. In reality short-term shareholder value rules and the Brits will sell anything and everything to please the City. As a German living in this country, I am aghast at this. Germany’s manufacturing prowess is founded on a much more long-termist approach. But Invensys is, sadly, a typical British industrial story. The company was created out of the merger of two engineering companies Siebe and BTR in 1999. The new company was debt-laden and poorly managed, going through a £2.7billion debt restructuring exercise in 2004. In 2005 the board appointed Ulf Henriksson as chief executive, who restored the company to financial health. Enter Sir Nigel Rudd as new chairman. In March 2011 he fired Henriksson, an engineer, because ‘he could not see the big picture’ and replaced him with the chief financial officer Wayne Edmunds. The share price subsequently halved in 2012 because of technical problems. It only bounced back when the break-up of the company was announced and set in motion with the sale of the signalling business to Siemens. The rest is now on its way to being swallowed by a French company for £3.4billion – well done, Sir Nigel. Does anybody get the message that these deals are a sure way to manufacturing oblivion in the UK? My own experience bears this out. I arrived in the UK 40 years ago to set up a UK subsidiary of a German lift truck maker. Our main European rival was the British company Lansing Bagnall, based in Basingstoke. Their market share in the UK was around 45 per cent and they exported 60 per cent of their production worldwide. They were the envy of the industry. Some 20 years later a large German industrial conglomerate bought them. A few years later they were sold on with the rest of the lift truck division to private equity, who closed the Basingstoke factory and moved the production to Germany and France. In 1994 my company bought the last remaining British lift truck manufacturer Lancer Boss, invested huge sums for a while, but then had to give up, close the plant in Leighton Buzzard and moved the production to Germany. One of the reasons was that they could no longer get cold-rolled steel sections for the lift masts of their trucks in the UK, as the Corus plant in the North East was ‘restructured’ – the other was that there was a cyclical downturn in the sector. There are dozens of industries and companies where the same or similar happened. Mergers, acquisitions, de-mergers and break-ups of companies are a favourite game in the UK to enhance so-called shareholder value. It promises faster returns for shareholders and bonuses for the board members rather than following the slower path of growing their companies organically. They would rather ‘return cash to the shareholders’ by share buy-back programmes and high dividends than invest in the future of their businesses and the prosperity of UK Plc. Author Bob BischofPosted on August 9, 2013 August 9, 2013 Categories Articles, British Business, Capitalism, Manufacturing, Policy, Shareholder valueTags british manufacturing, daily mail, real economy, sale of invensys, shareholder valueLeave a comment on Invensys Sale: UK Manufacturing On the Fast Track to Oblivion? This is an extract of an article published on January 13th 2013. It can be read in full on the Daily Mail website here. 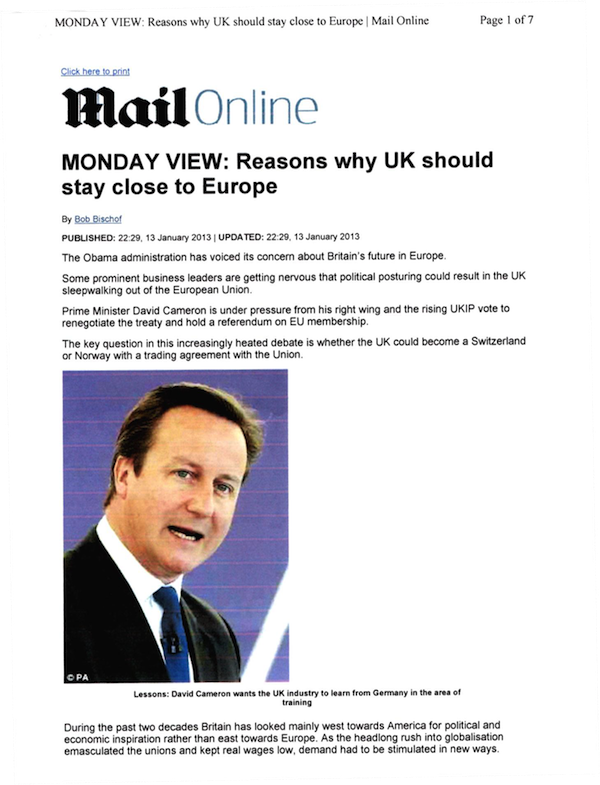 The Obama administration has voiced its concern about Britain’s future in Europe. Some prominent business leaders are getting nervous that political posturing could result in the UK sleepwalking out of the European Union. Prime Minister David Cameron is under pressure from his right wing and the rising UKIP vote to renegotiate the treaty and hold a referendum on EU membership. The key question in this increasingly heated debate is whether the UK could become a Switzerland or Norway with a trading agreement with the Union. During the past two decades Britain has looked mainly west towards America for political and economic inspiration rather than east towards Europe. As the headlong rush into globalisation emasculated the unions and kept real wages low, demand had to be stimulated in new ways. Under the last Labour government, Gordon Brown and Ed Balls took their guidance from Federal Reserve supremo Alan Greenspan and Wall Street. Following the US example, wage increases were replaced by increased limits on credit cards and rising mortgages on the back of the asset bubble. When Margaret Thatcher came to office in 1979, private household debt stood at around £60billion. When Labour got into office in 1997 it had risen to £750billion and when the Coalition took over, it had reached £1.45trillion. Instead of government debt being reduced during the boom years, the opposite happened, with the rescue of the banking sector completing the disaster. Taking the lead from the US in economic strategy has been an unmitigated disaster not only for Britain, but left other countries such as Ireland, Spain, Portugal and Greece. It even influenced such countries as Switzerland, France and Germany, as their banks were trying to become global players, pay their managers Wall Street salaries and adopt the casino culture. Fortunately, in the northern European countries the excesses were not quite as pronounced, but they now have the unenviable task of bailing out their profligate southern neighbours. Following the US lead during the past decade has not been a great success and no wonder open-minded people all over Europe are looking for alternatives. A lot of my German business colleagues regret, as I do, that Germany and Britain did not get together as leaders of Europe, as Helmut Schmidt and other German chancellors had hoped. Britain is approaching the crossroads and my hope is that leaders will look at the alternatives carefully and not be influenced by political expediency. This article was published in the Daily Mail, 9 April 2012. These days we tend to talk about the divisions in Europe as one between net creditors and debtors. In reality this is just a sideshow. There is a much more fundamental gulf, hinted at by Angela Merkel in her Davos speech yesterday: between countries with organised industrial training systems such as Germany, the Netherlands, Belgium, Scandinavia, Austria and Switzerland – all currently with jobless rates of between 3% and 7% – and those with much higher rates of unemployment, often in double digits, in peripheral Europe. The issue pits Anglo-Saxon precepts of free market regulation against the Germanic “Rhineland” system of managed capitalism, with modern apprenticeship systems built on a long-term compact between labour and employers. In the years before and immediately after the euro’s birth in 1999, the peripheral countries of the European monetary union (Emu) often followed Anglo-Saxon principles by liberalising parts of notoriously inflexible labour markets. “Hire and fire” became the motto. Initially this seemed to work. But as debt market conditions worsened and growth stalled after the 2007-08 financial crisis, Emu’s periphery has been left seriously exposed by the failure to replace unproductive regulations with new mechanisms to generate jobs. In the battle between rival systems, “Rhineland capitalism” appears to be winning hands down. In the two years since the global economic downturn in 2009, Germany has expanded employment by 1.8m, while the UK, US, France, Italy and Spain have shed 7m jobs. In 2007, when most other countries were nearing the end of a boom driven by excess credit, Germany had the highest unemployment rate (8.7% of the workforce on a harmonised basis) of the group of seven leading industrialised countries. Yet in late 2011, according to OECD figures, German unemployment, at 5.2%, was the lowest in the G7 apart from Japan. While the UK struggles with record youth unemployment, Germany’s youth unemployment rate is one third of the OECD average and one eighth of the rate in Spain. High youth unemployment is the most pressing problem in Europe right now – Merkel acknowledged as much when she admitted that mere austerity would make the European project meaningless for the next generation of young people. “Structural reforms that lead to more jobs are essential,” she said in her opening statement. But Merkel is drawing strength from Germany’s own experience with low unemployment in the mid-noughties, and she is right to do so. While the German labour market underwent some Anglo-Saxon-style deregulation under Gerhard Schröder in 2003-2005, it still places more emphasis on employers’ freedom to build long-term loyalty between employers and workers. These relationships are embedded in a strikingly different cultural approach to industrial training, closely tied to the German tradition of family-owned Mittelstand businesses buttressed by long-term savings that take a generational approach to assembling skills and technology. British politicians are keen to talk about “skills”, but at the same time they are reluctant to let go of the flexible labour laws that have set them apart from the European mainland in the past. They can’t have it both ways. Employers who do not have a sense of social responsibility for training are unlikely to be durably persuaded to hire apprentices through one-off state payments. Instead, governments should consider building comprehensive vocational training schemes that could be funded through a reduction in the social costs ensuing from unemployment. Tinkering with apprenticeship programmes on a piecemeal basis, as has been done in the UK, is unlikely to yield long-term results, as such half-hearted reforms result in expensive and wasteful systems that lack both scale and content. 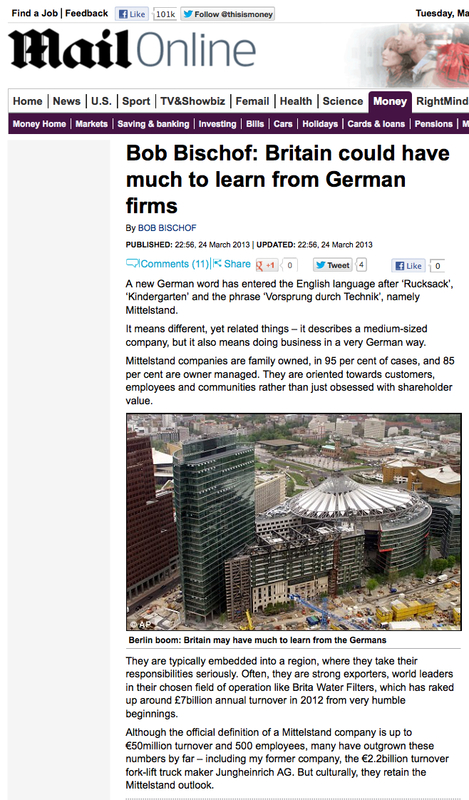 And it’s not just the German system of apprenticeship schemes that could do with being copied. One of the main reason why Germany’s economy was able to recover so quickly after the downturn was the system of short-time working support (Kurzarbeit), introduced in the 1920s and extended in recent years. Funded by an employment insurance levy, it pays for firms to keep workers for six to 12 months, provided employers can show their businesses are in a cyclical and not a structural downturn. Imagine a small engineering firm that ran into financial trouble in 2008: rather than letting go of the 17-year-old apprentice who had recently joined the firm, it would have been able to keep employees on board and then benefit from their experience when the economy was back on its feet. Even if the company had gone bust, the apprentice would by law have been sent to another company. Sir Anthony Bamford, chairman of UK excavator maker JCB, points out that his company was forced to shed more than 20% of staff in Britain when production halved in 2009. By contrast, the Kurzarbeit system enabled him to keep all his labour force in Germany. Such examples underline how Germany’s previously unfashionable model has enabled it to become the industrialised world’s premier job machine. As the economic climate darkens, 2012 will be a difficult year both for Germany to hold on to its advantages and for other countries striving to follow the German lead. Yet unless they start to lay the groundwork for longer term gain, time for catching up will soon run out.